Are your characters eye readers? They aren't mind readers, and they don't have a crystal balls, but I have found a real easy way around all that paranormal stuff when I'm drafting. I just have my characters stare creepily into each others eyes, interpreting every hitch of the eyebrow, slight shifts of hue in their irises, and glints of light against their pupils in the exact right way. His pupils dilate, and desire turns his ocean blue eyes to a deep indigo. I glance away, unable to hold his intense stare for too long. His gaze follows mine to the flier in my hand, and he lifts one eyebrow in challenge. Him: "I am so attracted to you right now, I think I will give up everything important to me for the chance to be with you." Her: "I don't know. Your crazy intense stare is kind of freaking me out, and I really want to save the whales." Him: "I will be your whale." 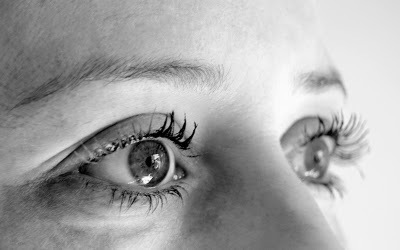 Used here and there, eye reading is an effective way to show emotion without having to dissect everything with dialogue. It can be poignant and move a scene along quickly, as well as establishing a certain amount of intimacy between characters. Context is key with eye reading. Do it too often though--or with the wrong character--and it gets cumbersome. For example: I have a character in my current WIP who is so wrapped up in her own world, she's isolated herself from life, but the second she meets anyone new, you'd better believe she's reading their entire life history in their eyes. 1. It's a lazy way of conveying emotion. 2.It's telling instead of showing. It may not seem like it is (I'm *showing* the gleam in his eye...) but it's still just telling. 3. It's boring. Using my first example at the top, there are so many better, more interesting ways to express whatever emotion Jenny's brother feels right before she kills herself, other than XYZ in his eyes. Any one else find themselves doing this in their writing?